Uche Jombo posted another picture of her cute son, Matthew. Read more after the cut..
“The only one who knows how my heart beat sounds from the inside #coverboy” she wrote in the caption of the picture. “This face just melts my heart #couldhebeanycuter #mytestimony pick up wow to read his miracle birth story #matthewRodriguez” she also wrote. 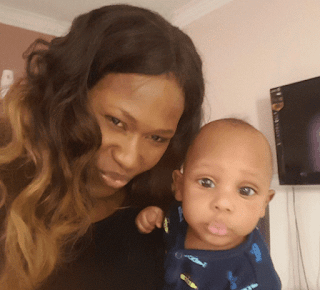 In the magazine Uche Jombo-Rodriguez talks about the loss of her first pregnancy, her 14-hour induced labour to birth Matthew, and complications that led to an emergency Cesarean section. Uche Jombo got married to Kenny Rodriguez in 2012. They had Matthew in May. He had his baby dedication in August. The dedication was done in Houston, Texas.